"I know all this and more... "
Whew! What a weekend! The boyo was over since Thursday night so I've been visiting with him. It's not often that I get that much time with the boyo, so this was an especially nice treat. 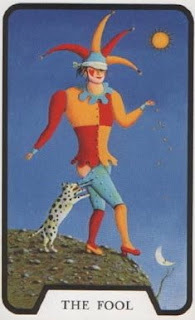 I'm taking The Fool from the tarot deck as a reminder of what I'm after, of what I keep losing sight of. "The Fool is the spirit in search of experience. He represents the mystical cleverness bereft of reason within us, the childlike ability to tune into the inner workings of the world. The sun shining behind him represents the divine nature of the Fool's wisdom and exuberance. On his back are all the possessions he might need. In his hand there is a flower, showing his appreciation of beauty. He is frequently accompanied by a dog, sometimes seen as his animal desires, sometimes as the call of the "real world", nipping at his heels and distracting him. He is seemingly unconcerned that he is standing on a precipice, apparently about to leap, engaged in the supremest act of idiocy or trust. The number 0 is a perfect for the Fool, which can become anything when he reaches his destination. Zero plus anything equals the same thing. Zero times anything equals zero. Zero is nothing, a lack of hard substance..."
So... *dusts off hands* I've been up to getting some things back in order. Bills, house keeping, etc. Still looking for a job. The dream job decided to go with someone else so... well, I guess it just wasn't meant for me. I keep on searching and hope I find that right fit. It's been slim pickings with the holiday weekend. Still, I search the listings online and I wonder, "What will work for me?" There are a few listings for management positions in retail. I was shying away from those but now I wonder if perhaps it's something I should look into. I'm completely upside down when it comes to what to do, what to look for and I find my head reeling each time I look at the listings. Life's too short to work for something just to exist, I still believe that, but I'm finding that my ideals aren't quite fitting in with the real world. However, I still feel like the answer is right at the tip of my fingers... and if I could just stretch the tiniest bit more, I'd reach it. Maybe I'll defy everyone and write a book after all. ha!